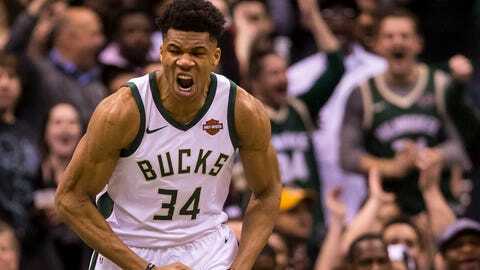 Barring catastrophe, the Milwaukee Bucks will be the top seed in playoffs in the Eastern Conference. Milwaukee's magic number to clinch the No. 1 spot is one -- meaning just one Bucks win or one Toronto Raptors loss is needed. 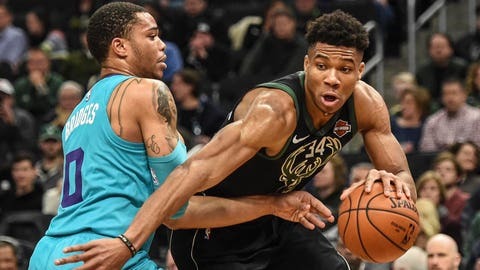 Keeping in mind the Bucks have four games remaining, beginning Thursday night, and have lost back-to-back games just once all season (and never three in a row), if you'd be pretty safe in using a permanent marker on your NBA bracket. But who the Bucks face in the first round of the playoffs might just come down to the final day of the season (next Wednesday). There's a bit of a logjam at the bottom of the Eastern Conference standings, with five teams potentially being in the eight spot. Below we look at all five, in order of current record (as of April 3 games), what games they have remaining and how the Bucks matched up against each. 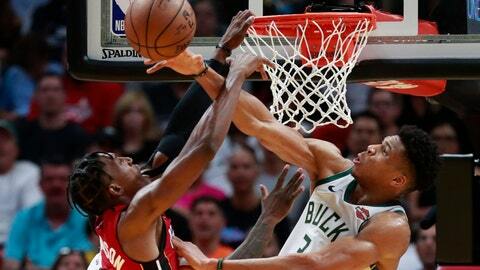 Bucks matchup: Milwaukee won all three games, including two on the road. Skinny: Detroit is sputtering down the stretch (2-5 in last seven games) but has the easiest remaining schedule of those vying for the final few playoff spots in the East. 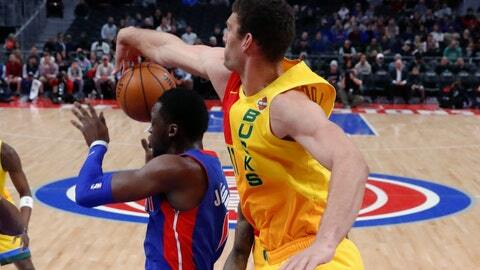 Blake Griffin (24.7 ppg) has missed the Pistons' last three games -- Detroit losing two of those, both against Indiana. It would seem that the Pistons are fairly safe to not drop to the eight seed, but Griffin's status is up in the air don't get out that pen just yet. Bucks matchup: Milwaukee is 3-0, including two wins on the road, with one to play at home. 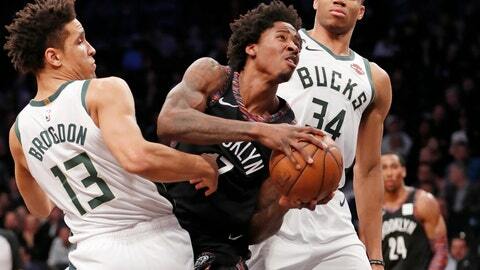 Skinny: The Nets have the toughest remaining schedule, having to play Milwaukee and Indiana on the road on back-to-back nights, and then face off against Miami in a potential playoff-elimination game (but at least that one is at home). After winning four straight from March 4-11, the Nets are 3-7 with the losses coming to the Thunder, Jazz, Blazers, 76ers, Bucks and Raptors. 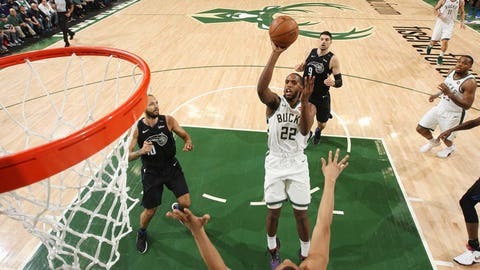 Bucks matchup: Milwaukee was 2-1, with the loss coming at home on Feb. 9, the most recent meeting between the two teams. Skinny: Orlando got back in the playoff picture with a six-game win streak from March 14-26. The Magic are 2-2 in their last four, with wins over the Pacers and Knicks and losses on the road to the Pistons and Raptors. Orlando have to close with two games on the road, where it is 15-24 on the season. The Magic recently signed Michael Carter-Williams. He's played in nine games and when on the court with Aaron Gordon, the Magic have a 117.1 offensive rating and 101.6 defensive rating (according to cleaningtheglass.com). Remaining games: Friday at Timberwolves; Sunday at Raptors; Tuesday vs. 76ers; Wednesday at Nets. Skinny: Can Miami get Dwyane Wade to the playoffs in his final season? The Heat will have to do it without Josh Richardson (16.6 ppg), who is expected to be out for the final four regular-season games. Miami dropped back-to-back games to the Celtics to fall to the 9 spot. The Heat have three games away from home to finish up, but have a 20-18 road record. They also could be the benefactor if the Raptors and 76ers rest players in preparation for the postseason. A final game in Brooklyn looms large. Skinny: Charlotte got back in the race with a four-game win streak but then lost three in a row on the road before beating New Orleans on April 3. The Hornets have a tough climb from their current position at No. 10, but could benefit if Toronto rests players (providing the Bucks clinch) and get to play Orlando at home, where they are 24-15, to end the season. The bad news is they also have to play two games on the road, where they are 12-27. The Hornets are a longshot for eight seed and have a small margin for error.